LONDON--(BUSINESS WIRE)--The global hand dryer market is expected to grow at a CAGR of more than 13% from 2018-2022, according to a new market research report by Technavio. Technavio’s report on the global hand dryer market analyses the business dimensions and presents a comprehensive breakdown in terms of market segmentation by operation, including automatic hand dryers and push-button hand dryers. As projected in 2017, more than 83% of the market share originated from automatic hand dryers. Automatic hand dryers are more hygienic as users are not required to touch the appliance, which reduces the possibility of germ transfer and contamination. Based on product, the global hand dryer market has been segmented into hot air hand dryers and jet air hand dryers. As of 2017, more than 62% of the market share came from hot air hand dryers. “Hot air hand dryers produce lower noise levels when compared with jet air hand dryers. Therefore, they are used in places such as schools where high noise levels might cause disturbances. They take about 35 to 40 seconds to dry hands in comparison to the 15 seconds or less of jet air hand dryers and 10 seconds of paper towels. Hence, these dryers tend to have higher running costs,” says a senior analyst at Technavio for home, kitchen, and large appliances research. The global hand dryer market is considerably competitive because of the presence of both well-established vendors and other vendors operating across the globe. With the increasing competition, the vendors in the market are concentrating on developing innovative products to meet the changing demand of the customers. Therefore, the launch of new products is expected to intensify the competition during the forecast period. Access Technavio’s continuously growing home, kitchen, and large appliances research library and find expert analysis on hundreds of markets. 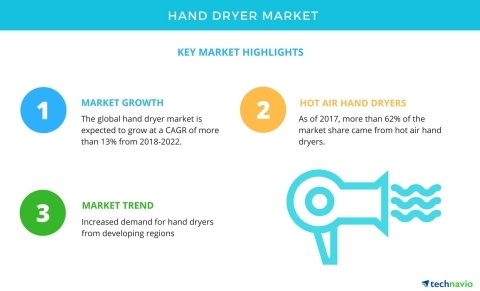 The global hand dryer market is expected to grow at a CAGR of more than 13% from 2018-2022, according to a new market research report by Technavio.